So, this is my first post on my first ever blog. I feel quite nervous, even when it’s just my keyboard and me. But I want to share my thoughts, views and enthusiasm for the natural world in Cornwall, so here goes! I’m conscious I’m joining many others already writing about this wonderful county, but it has enough to offer to inspire many more again. My main focus will be to write about the many exciting things going on in Cornwall for conservation and biodiversity and about the places of natural beauty to visit west of the Tamar, as well as about some of the great people living in the county who are working hard for conservation. My first post is more reflective, as I start a new journey in life – but there’ll be plenty of more down-to-earth stuff to come! Everyone needs a place to call ‘home’ – a breathing space, a port in a storm, or whatever phrase you prefer. Deciding to move to Cornwall permanently earlier in 2012 after a year studying near Falmouth confirmed to me that home is not so much about ‘four walls’ as it is about a place of inner retreat, a safe emotional haven to recuperate before setting off on the next adventure, but it can still be anchored in real places and people. My family in London are my main anchorage, friends in other parts of the country are others, but in terms of places, my first Cornish anchoring point, as a student back in 2010, was Loe Bar. I was living just outside of Helston, at the top of the Lizard Peninsula, about four miles away from Loe Bar, so I set off to explore. Loe Bar, lying between the Atlantic waves and Cornwall’s largest natural freshwater lake, Loe Pool (or simply The Loe – Loe derives from the Cornish logh, meaning pool), is nationally, even internationally, renowned in geological terms as a fine example of a bay-bar, a bar of sandy, silty sediment formed across a bay, creating a lake behind it. 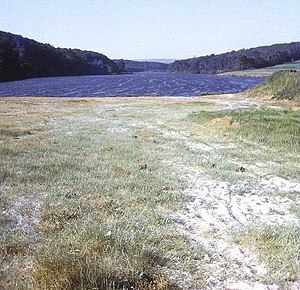 In the case of Loe Bar, it lies across the original but now drowned estuary of the River Cober. Both The Loe and Loe Bar have some mysteries attached to them. The Bar itself is mainly composed of sediment that is nothing to do with the nearby cliffs. The geological jury is out, but the most likely explanation is that the grit and sand has been transported by the strong (and treacherous currents) from over 100 miles up the coastline. On the subject of those treacherous currents, the drownings and shipwrecks they have caused through the centuries have probably led to the tradition that The Loe claims a life every seven years (definitely not a place for a swim). Tradition also has it that The Loe reclaimed Excalibur – it is a contender for the site where Sir Bedivere threw Arthur’s sword into the waters. 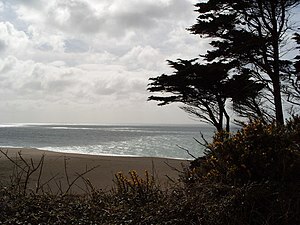 Loe Bar is however atmospheric enough without the need for myths and legends. You can reach it by a gentle two-mile walk from Porthleven to the west along the SW coast path, but my favourite route, and the way I first approached it, is to park in the public car park at Penrose and walk through the National Trust-owned Penrose Estate. I’ll talk about the lovely Penrose in a future blog soon, but for now the point is that, walking this way, you approach The Bar from above, and the effect of emerging from the wooded path to the sight of the Pool, the Bar and the waves of the sea beyond them opening before you is straight away to expand and refresh your spirit. Once your feet are walking in the sand of the Bar (like any beach, it’s hard to resist shedding your shoes), the reality doesn’t disappoint. I’m always struck by the different characters of the sea and pool sides of the bar, helped by the steepness of the slope meaning that you cannot always see both except in the middle strip. At the lake edge, the vegetation changes from salt to freshwater (the sea has little if any influence on the composition of The Loe’s waters), in the winter visiting birds rest and feed on the water (including my favourite Shovellers and Tufted Ducks), and once I eyeballed an adder before she disappeared fast into the undergrowth. On the ‘other side’ you are clearly on a beach, sea fishermen sit by the waves with their lines, and you can see gannets speeding close to the water, as well as the ever-present gulls. But they are not really apart from each other – gazing at the waters of The Loe you can still hear the crashing waves just out of sight, while looking out to sea, you remain aware of the still presence of the lake, ever behind you. In my more fanciful moments, I like to think of Loe Bar as a symbol of one of those life transitions, with the move from peaceful woods and walking across its sands towards the sea standing for moving on to new challenges, new adventures, but with the security of your safe anchorage always ready behind you. Whatever, Loe Bar is an entrancing place to visit, so do try to get there to clear your head and widen your horizons before setting your feet on the road again. Check out the National Trust website for more about Penrose and Loe Bar. And enjoy the engaging ‘Man on a Beach’s mini-interviews on Loe Bar.